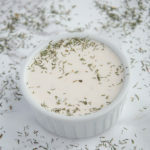 This Vegan Ranch Dressing recipe tastes like the real deal and really, it’s quite delicious. It was first created as a dressing for our tasty Buffalo Cauliflower Tacos, however after trying it we found it’s uses really are endless. You can use it on salads, as a dip for vegetables, or to put your pizza crust in. 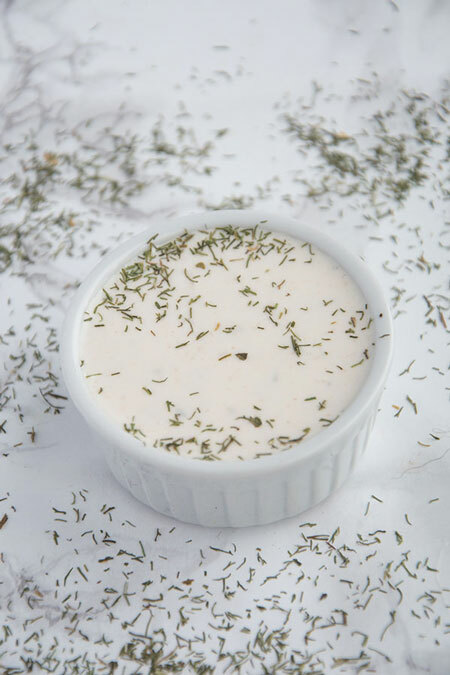 This vegan ranch dressing couldn’t be more straightforward and uses ingredients that are typically on hand. I am not a fan of dill, in fact I really hate dill however it is a very necessary ingredient in this dressing so don’t skip it! You don’t taste it much, it just helps to balance out all of the flavours. To a small bowl add the mayo, almond milk, apple cider vinegar, lemon juice, garlic, onion powder, salt, paprika, dried parsley and dill. Whisk all of the ingredients together until well incorporated. Taste and adjust salt as needed. Place in the fridge for 10 minute to allow dressing to thicken up slightly.